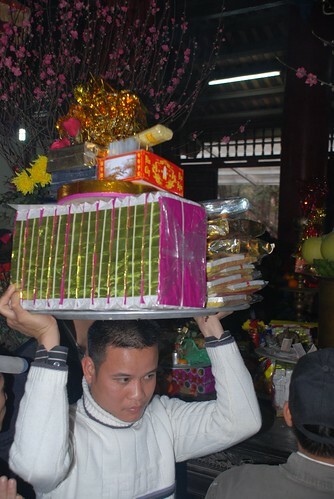 Spring is pagoda season in Vietnam but truly people pay more attention in the north than other parts of Vietnam. 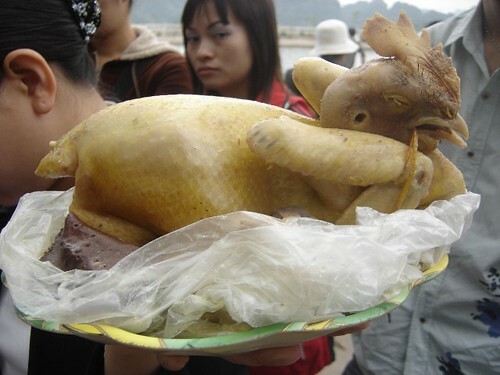 Almost every single man knows how to prepare for these special festival occasions and I am really impressed about that. It also means this aspect of our culture will never end. 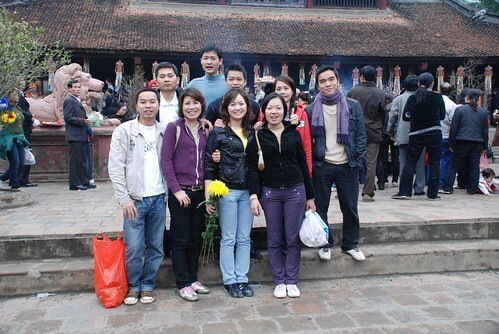 As in the past years, my friend and his colleagues invited me to join their pagoda trip to photograph the day. We met up in front of the Sofitel Plaza Hotel at 5 am and had some noodles nearby then headed to the Perfume Pagoda in Ha Tay province. The weather was quite bad, damn cold and raining but it improved after 2 hours. The driver was excellent as we didn't have any problems at all. We arrived at the Yen River where we parked the car and picked up the boat. The girls sat in the cafe to fill up the wish lists for everyone then we took a big 35 seat iron boat to the pagoda dock. The boat trip was really pleasant and I love coming back here just to see people doing their own praying, organizing their food on trays and the scenery along the river. We arrived at Trinh Temple at first for my friends to pray for over half an hour and I took that chance to take photos and look around. It was really crowded even though it was Monday. It was fun to see my friends organizing their food tray, everyone put some money on the tray as well as soft drink, fake money, wish lists, beer, chicken, sticky rice, biscuits, fresh fruit, cigarettes, flowers and incense. It sounds like a lots of things but it looks very nice and very organized. Some other people put even more stuff on their small trays which end up very heavy. 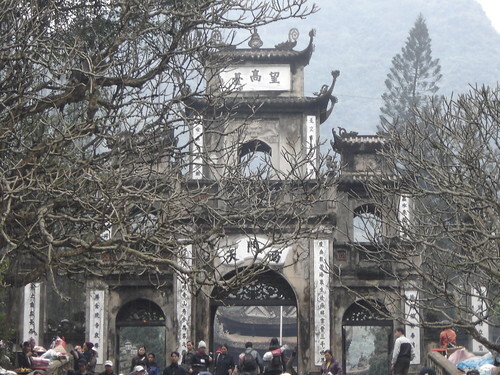 After 30 minutes, we left for Huong Tich Cave which is the most religious place to go. I will tell you more about this in part II. Please take a good look at my flickr website where I saved all of the photos. 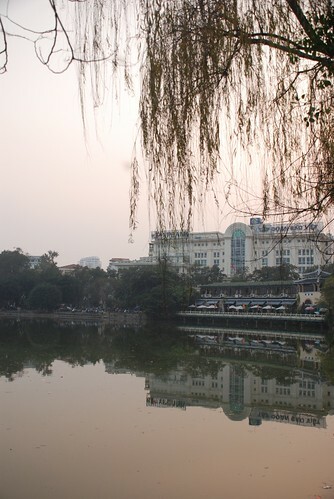 Most people imagine Hanoi as a hot climate city, but I'm telling you that recently the weather is really damn cold. 10 degrees in Vietnam sounds like nothing compared to minus 10 or even minus 30 degrees in other countries but it's really different if you ever make it to Hanoi. The humidity makes the colder seem really cold. It gets in your bones. There have been quite a few old people and livestock who have died in Hanoi. 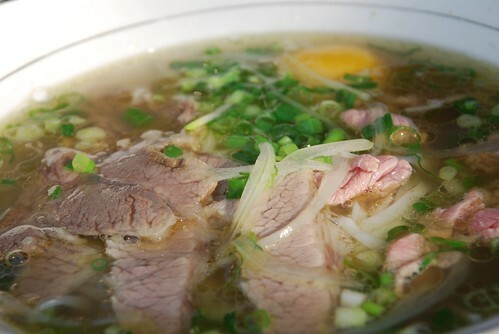 Also lots of people have been sick throughout the north of Vietnam. In Sapa, the weather was minus 5 degrees, freezing and there was snow but people continued to go up to see snow for the first time ever in their lives. I wish I could see snow too as I never ever seen it before. It must be beautiful! In one magazine, there was a report about one baby who died on the back of a motorbike in Hanoi because his parents forgot to cover his face and they only recognized when they were stopped by the police for not wearing a helmet. I couldn't believe my eyes reading that news. How could they let their children travel on the motorbike in such horrible weather conditions? I wondered. Also, almost ten babies die because of lung disease but the main reason was the cold. Even schools were closed on those days as it was too cold for children. The weather gets warmer but worse in the next two weeks with rain, high humidity and damp. Now we must wait for the weather to improve and the sun to come out and the time when we can get rid of all the winter clothes. The other day, I had to wear three shirts, three pairs of pants, gloves, a thick jacket, scarf and winter hat but I am sure many people out there were wearing more than me. Another thing I want to mention is all that all of the clothes shops and electrical shops put their prices up unbelievably high at these times. There should be a law against businesses which take advantage of the weather situation. Spring in Vietnam, especially in the north, is the time that almost every person visits pagodas wishing for a great lucky year ahead. 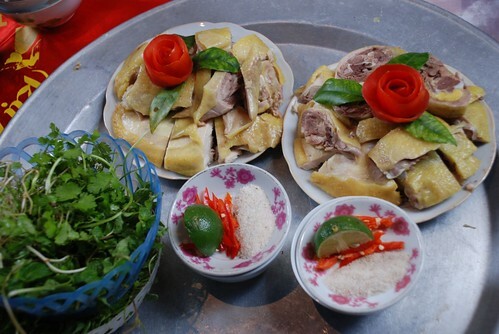 This is a traditional side of Vietnam's culture. 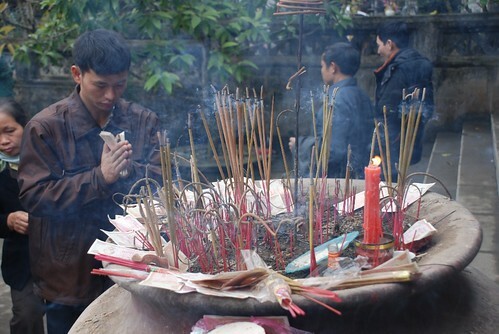 Most people choose the Perfume Pagoda, Yen Tu Pagoda for destinations outside of Hanoi. 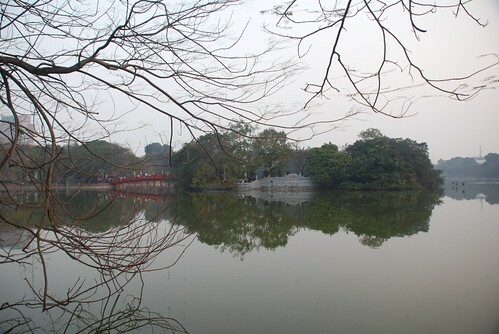 Some people choose the most famous pagodas in Hanoi such as the Defence Pagoda, the One Pillar Pagoda and Phu Tay Ho for their city destinations. 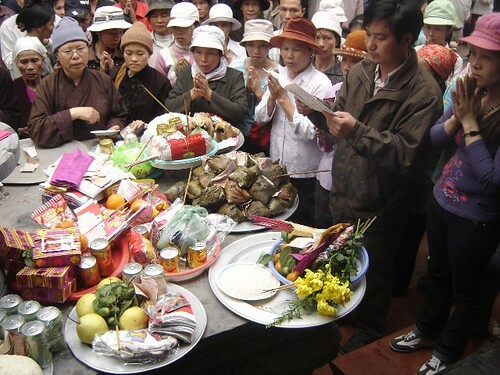 By going to these places at this time of the year, you can see thousands of people coming to do the same thing - preparing food, incense, drinks and very long wish lists of paper. I joined with my friends the last few years for fun and to take photos even though I don't follow any religion and I'm not a very ceremonial guy. I love to go these pagodas and temple because I like to see people doing their little prayers, talking to them and it's nice to see people maintaining their traditional culture. I remembered last year seeing my friends spend almost twenty minutes just praying and reading their wish lists. I asked them why they had to spent so much time on these things and God cannot listen to theirs as well as thousands of people's wishes at the same time. They told me that's the way it is and just smiled. Maybe I should do the same thing instead of just lighting a few insence sticks:). It's also not easy to reach the altar as hundreds of people are crowded in with their full trays of fruit, food and a huge cooked chicken on their heads. 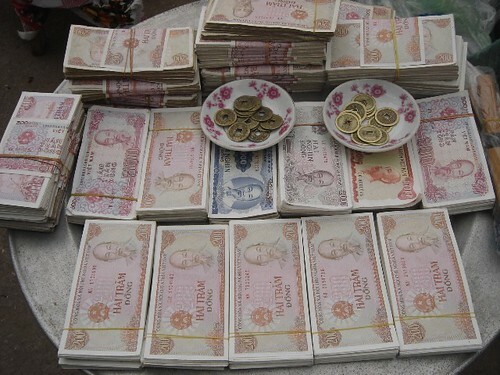 There is a very special service where people can change big notes to small notes - 500 dong, 1000 dong, 2000 dong and 5000 dong. Most people put the money on their food trays and on the altars or give it to beggars in the hope that some of it comes back during the year. I will join with my friends again to go to some pagodas on the weekends and hope that I can take some good photos and show you guys some new stories about these pagoda festivals soon. 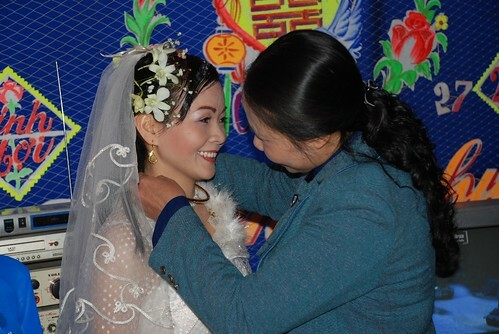 Cong, one of my good friends from Hanoi decided to get married 3 weeks ago, just before Tet. 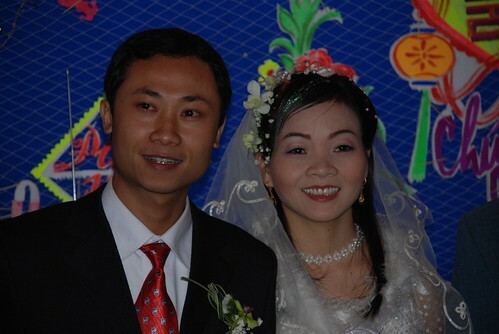 My friends and I hired a car and went to his wedding in Thai Binh, a small province near Hanoi. It took us over three hours to get there due to the crazy traffic and the pre spring rain. This weather is pretty good for young married couples - the cold and rain means they will have more time together inside the house :). 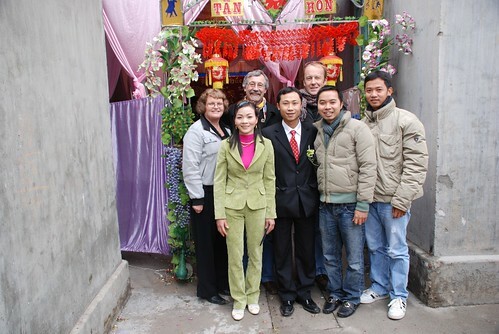 Finally, we got to the bride's house in Nam Dinh for the celebration. Everybody was expecting us as my friend had mentioned to them that some of his western friends were coming with me. This maybe was the first time some of these villagers had ever seen westerners before and they were all staring, talking about them and touching my western friend's arms. It was really fun and we didn't expect that many people in the party. They were dancing, drinking tea and eating watermelon seeds. The ceremony included relatives of my friend's wife giving her money, jewellery and making speeches. There were lots of old people in very old traditional dresses who looked really nice and they were very friendly. We stayed at the bride's house for twenty minutes until the ceremony finished. Then my friend and his family took her to his house in a very nicely decorated car. We all followed that car and headed to Thai Binh for another set of speeches then party time. We lost the group because our driver was driving so slowly and couldn't follow them. We had to make many phone calls and asked people on the street for thirty minutes and eventually Cong had to sent his friend to meet us on the main road. Anyway, we got there and after twenty minutes we started our meal. We were served cat meat, pork, beef, chicken, squid, crab, dear, sticky rice, shrimp and fresh fruit. It was really a treat as all the food was yummy and had been well prepared by his friends and family. Cong and his wife looked so happy and they smiled the whole time and, especially in their eyes, we could tell it was true love. We all wish them happiness and a great future. Thank you for inviting us to join such a great party. Also thanks to your families and friends who have treated us so sweetly and provided such great food. All the best from Vietnamese God and his friends!!! 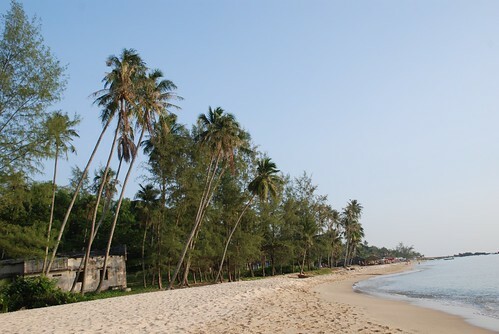 During my trip to Pho Quoc, I decided to take it easy for one full day just relaxing and walking along the beach. In the evening, I met up with my friends, Anne and Arno, for dinner at the Rainbow Bar which is right on the hotel's beach. We started with some cocktails and beer then we had two bottles of red wine and white wine over the whole evening. We felt a bit drunk afterwards and then we booked a table for Christmas Eve which was the next day. Following the recommendation of the restaurant boss, we pre-ordered 2 big fish (about 2kgs) for grilling which for some reason is much cheaper than ordering on the day. That suited me as I had more money for wine! 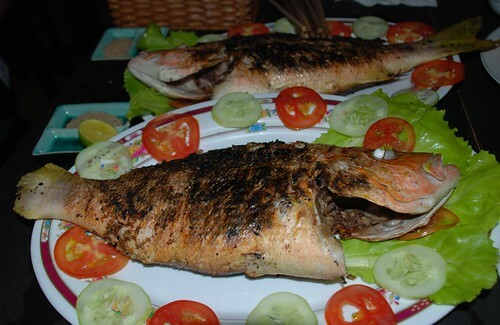 We had a great time on that evening and the grilled fish was so good plus in addition to the barbequed crocodile, squid and prawns. I suffered from a really heavy hangover the next morning before having my last look at Phu Quoc before leaving for Saigon at midday. I hired a motorbike to drive to town for a big bowl of noodles for breakfast and to take some final photos plus 2 pills of panadol and a can of red bull. I felt a bit better but I didn't realize that I left my wallet in the taxi to the airport with all my money and my bank cards. Thank god, I called the hotel and Tuan Anh, the receptionist, solved my problem and the driver brought it back to me at the airport. The last few words I want to say about Phu Quoc are: Peaceful, Beautiful, Sweet people, Great food and Thuan Kieu is such great resort. 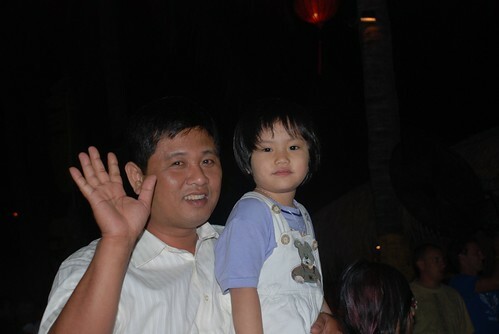 I want to thank Tuan Anh and Phu Quoc has given me such a memorable trip and I'll be back for more. See you again soon, Phu Quoc! 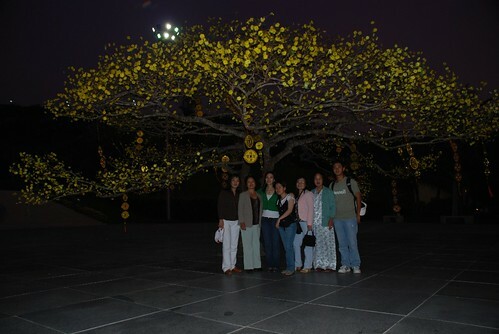 Nha Trang - Happy New Year 2008!!! 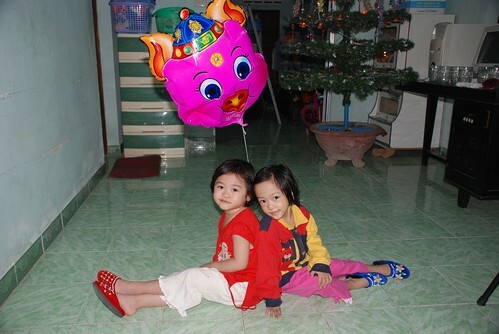 Chinese New Year in Viet Nam is called Tet. 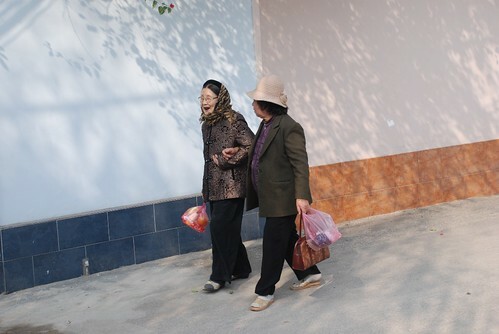 All over Vietnam, Tet is the family reunion time where everyone is supposed to return home for a few days. That includes me. I went back home for two weeks to be with my mother and my sisters and brother. Back in Nha Trang for two weeks isn't really enough as I couldn't try as much local food as I would like but at least I had such a great time with family and good friends. 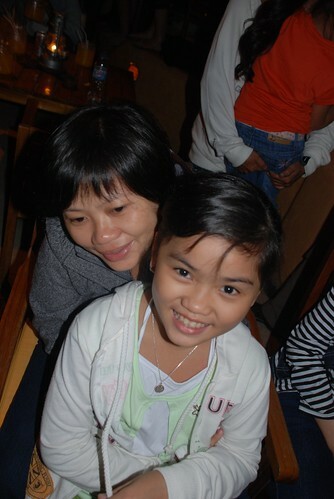 My family and I chose the Sailing Club to welcome the new year. This is a really beautiful bar right on the beach BUT it is a bit of a rip off place as well for beer as it's almost double price compared to other places in town. They have really good music, a great location right on the beach and everyone seemed to come here on New Years Eve for a drink or two and to see the fireworks. They also charged a $4 entrance fee that you can exchange for a small bottle of beer, soft drink or an awful jar of cocktail. Anyway, we had a great new years eve and I was a bit drunk at the end. My mother was preparing lots of food at home waiting for us to return home. 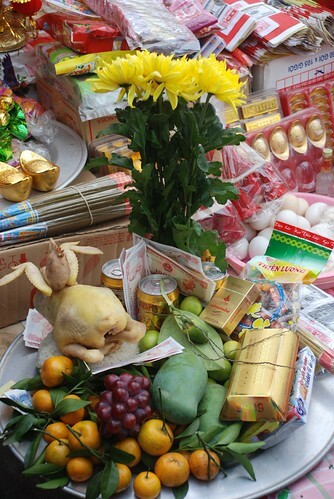 In Vietnam, it's very important that the first person to enter the home after the new year is someone who will bring the family good luck for the coming year. It also depends on that person's year of birth and normally the family choose. With my family, I am usually the first person every year because I always come home earlier than other people but not this year as my brother came home first. 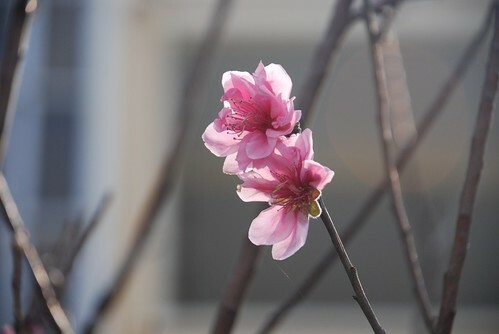 I hope we will have the greatest year this year. Happy New Year everyone and best wishes for the coming year. Welcome to 2008, the year of the Rat!!! I joined the squid fishing tour for a few hours that evening and this is such a fun thing to do for experience. It cost only $15 including transport. 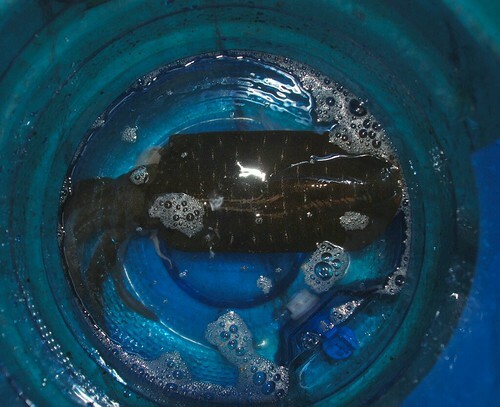 Catching squid is not as easy as I thought and not a single person could catch anything for three and a half hours. There were two young girls working for the tour company who joined the trip with us and they vomited non-stop which made me feel sick as well. Anyway, the tour company prepared some squid porridge and some fresh fruit for everyone and it was really good. One morning, I hired a motorbike with a driver to discover the north of Phu Quoc, including a fish sauce factory, national park, pepper farm, Nguyen Trung Truc hero temple and the Viet Nam - Cambodia border. Discovering Phu Quoc by motorbike is such a great way as I could stop at any place for photos, coffee or even the toilet. The downside was that my whole body got covered in red mud after travelling over those roads for a few hours. I was really impressed by the wild beaches along the coastal roads. They all look so clean with white sand and virtually nobody around. I bought quite a few kgs of black and white pepper from the farm for me and my good friends from Hanoi. Phu Quoc's pepper is really famous throughout Viet Nam. The fish sauce factory was interesting as I saw hundreds of huge timber barrells which can hold over 15000 litres each. 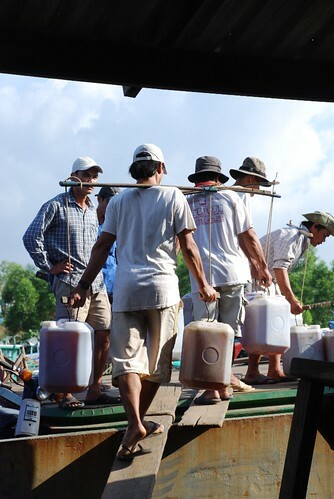 Fish sauce in Phu Quoc is acclaimed over the world and I eat it almost everyday at home with rice. Some of my friends asked me to bring back some but it's illegal to carry fish sauce on a plane in Vietnam.